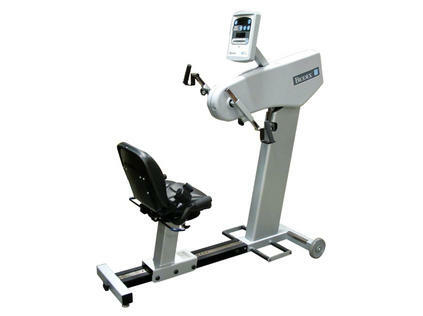 An upper-body ergometer that will exercise individuals with limited lower-body function. Use the Upper Body Cycle anywhere. There is no need for AC power at work rates at or above 30 watts and 50 rpm. The battery-supported system maintains all settings and LED displays before and after cycling. The internal battery is automatically recharged when work rates reach or exceed 30 watts and 50 rpm. An AC adapter is provided for extended use at work rates below 30 watts and 50 rpm. The "Quick-Start" feature gets your first-time cyclists right into their exercises. Isokinetic (speed control) provides accommodating resistance throughout the cyclist's entire range of motion for the duration of the exercise period. Resistance continuously matches effort, accommodating to variations in the patient's force output due to weakness or pain at specific points in the individual's range of motion, and to fatigue over the course of the cycling period. With a selection of 15 speeds (50 to 120 deg/sec), this resistance mode maximizes strength gains while minimizing the potential for injury. The welded heavy-gauge steel frame, epoxy powder-coat finish, and moisture-resistant ABS plastic enclosure, round out a rugged and durable design that will withstand extensive use in the busiest settings. Large wheels make transporting and repositioning easy. Heart rate monitoring can be achieved with a telemetry chest strap to track heart rate without interrupting exercise – useful for protocols utilizing target heart rate, and for monitoring high-risk patients. Patients with hand and wrist limitations will find comfort and security of maintaining stable hand position throughout the exercise session. The Hand/Wrist Cuffs allow users with limited or no hand strength or control to enjoy the benefits of upper body exercise. Self-powered, self-charging, cordless capability – use it anywhere! Total upper body rehabilitation, strengthening and conditioning for all shoulder, back, neck, wrist and elbow patients. Provides a great warm-up prior to all upper body exercises. 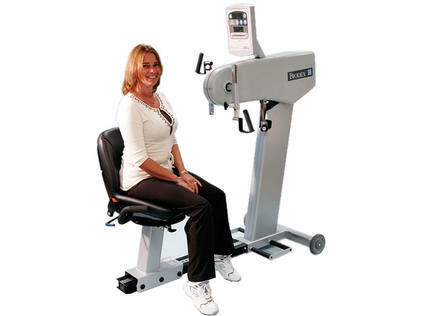 Enables early phase ACL patients to perform cardiovascular activities. Stand patient next to the UBC in a 90°/90° position and perform internal/external rotation against bi-directional isokinetic resistance. Excellent warm-up prior to activities. Low seat height makes wheelchair transfer easy or seat can be removed entirely to allow exercises while remaining in the wheelchair. Adjustable pivoting actuator easily accommodates all wheel chair patients. Begin patient with actuator adjusted in low position thus decreasing elbow flexion. As ROM increases, raise actuator to increase elbow extension. Start the patient seated against the back of the seat providing lumbar support, progress to front edge requiring more lumbar stability, then to standing in neutral spine which requires full lumbar stabilization. Begin immediately with shoulder ROM exercises below 90 degrees shoulder flexion. Upper Body Cycling to prevent deconditioning of the older patient. Allows usage of smaller muscle groups and strengthening of chest muscles following open heart surgery. 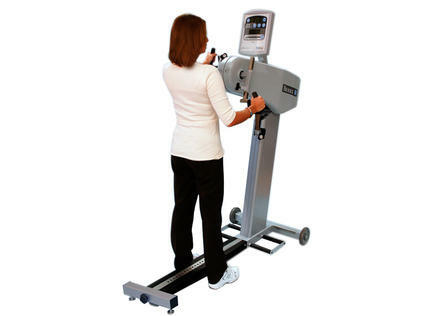 Maintains cardiovascular health in patients faced with a debilitating lower extremity injury or paralysis. Power: Self-powered; no external power requirement at user work rates over 30 watts and 50 rpm; 115 VAC adapter (230 VAC available) is provided to power system and charge battery during applications below 30 watts and 50 rpm. Battery automatically recharges at work rates above 30 watts and 50 rpm. Certification: ETL listed to UL60601-1 and CAN/CSA C22.2 No.601.1.M90, EN 60601-1: 2nd Edition. EMC compliance to EN 60601-1-2.